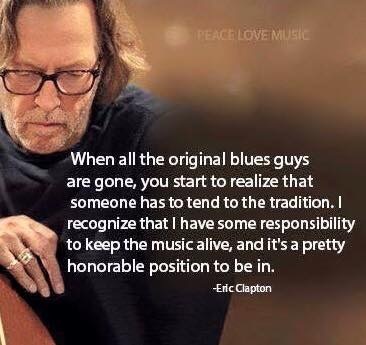 I am a huge Eric Clapton fan, not just on the stage, but especially off the stage as well. He is a true scholar of The American Blues to the point of immersing himself in it despite where he is from and his being a rock and roll legend and superstar. I share the same love and drive to preserve real musical art as he does. You know, real people, playing real instruments with some skill and talent, and crafting stories of real life and real experiences. Unfortunately, year by year the sheer number of us folks that have this appreciation thins out. You know who you are, the ones that are passionate music lovers that care for the art understand the connection between Americana roots music and blues, folk, country, jazz, bluegrass, R&B, etc. Just like we do. In these times where so many of the music pioneers have left us, we need ambassadors to keep the Americana Music genres alive. We have, in part, assumed that duty at Saddle N Spurs Saloon [ http://saddlenspurssaloon.com ] in Las Vegas. We have successfully and unsuccessfully attempted community partnerships in Las Vegas for this cause and will continue seek out to do so. We appreciate all the customers that are like us and that come and spend money on food, drink, and gaming at our place to help facilitate our place in our local community, to support the art and the people that create it. No, we don’t generate a lot of money every night and more often than not, we have to subsidize a bad night with a good one to pay the musicians what we can afford to pay and the staff that works so hard to glue this vision together. I write these little blog posts to try and put things into perspective for others that may wonder why we do what we do. Sometimes we manage to connect with others that want to be a part of this vision and join us to strengthen our cause in our very own local community. When you truly think about it all, it will amaze you at how hard you have to work in order to preserve something so beautiful, something that is so intertwined in every day life, something that is taken for granted in so many ways everyday, all in the so called entertainment capital of the world, Las Vegas. If we cannot do it here that it saddens me to question where else could it survive and flourish in today’s times. Thank you to the paying customers, staff, and community partners that help us do what we do for the true art of Americana Music and to help support the people that create it. We love you all! This entry was posted in My Musical Thoughts. Bookmark the permalink.